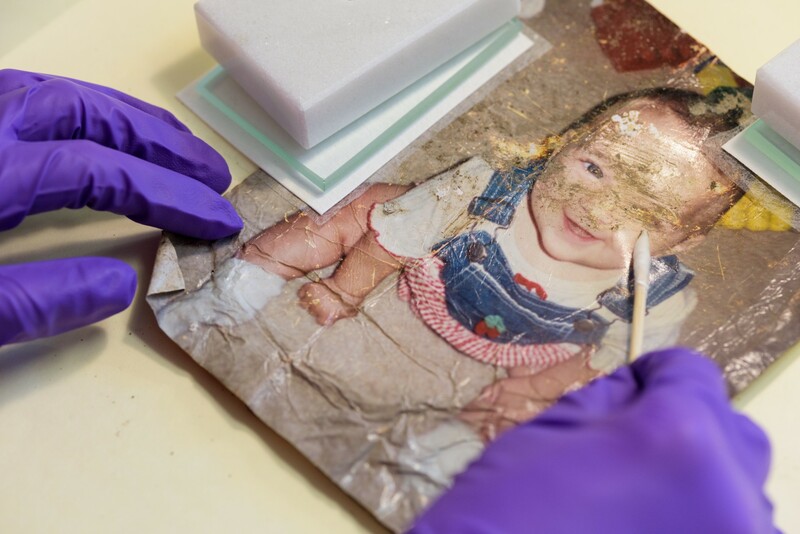 Jacklyn Chi, a first-year Master’s student in the Winterthur/University of Delaware Program in Art Conservation removes embedded dirt and grime using a dry cotton swab from a family photograph salvaged from the Wimberley, Texas floods. Image courtesy of Evan Krape, the University of Delaware. The Winterthur/University of Delaware Graduate Program in Art Conservation is one of only five graduate programs in North America that educates and trains conservators. Part artist, part scientist, part humanist, these specialists preserve and restore the artifacts—ranging from great works of art, to fossils, books, and letters—that populate museums, libraries, and archives. Their work makes it possible for scholars to reveal new discoveries about the past and for museums and other institutions to educate the public. Recognizing that preserving cultural heritage is crucial to the United States, the NEH has supported research and training in the graduate program since 1974. 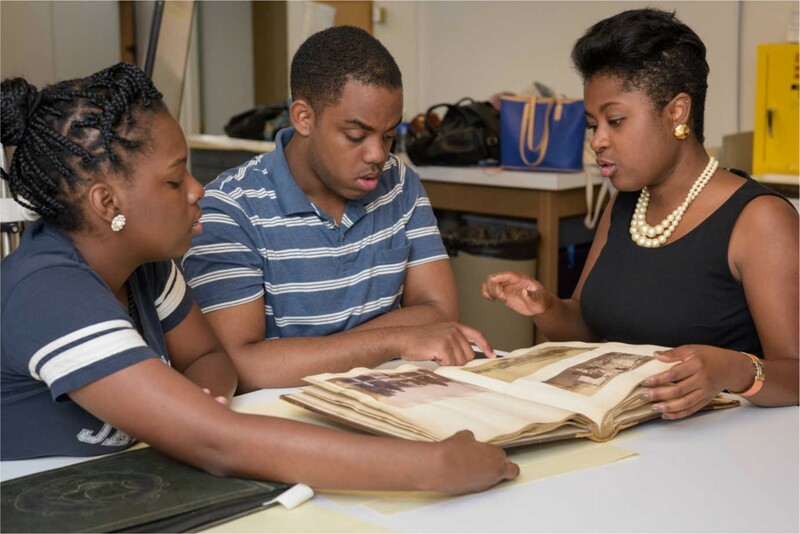 A third-year Master’s student in the Winterthur/University of Delaware Program in Art Conservation (left) examines a 19th-century photographic album with two students during a UD seminar focused on the preservation of the rich and varied photographic collections in historically black colleges and universities. Image courtesy of Evan Krape, University of Delaware. An NEH challenge grant, which helped the university raise an additional $1.5 million, has helped the department expand its curriculum as well as provide opportunities for faculty and students to engage with the public. In addition, NEH grants have consistently provided funding for the graduate stipends that make it possible for students to pursue this course of study. Students in the Master’s of Science program must demonstrate a strong foundation in chemistry, material cultural studies, art history, and studio art skills. A cohort of 10 students enters the three-year program every fall. In addition to coursework, they work in conservation and research laboratories at the Winterthur Museum and undertake internships in museums and cultural institutions across the globe. 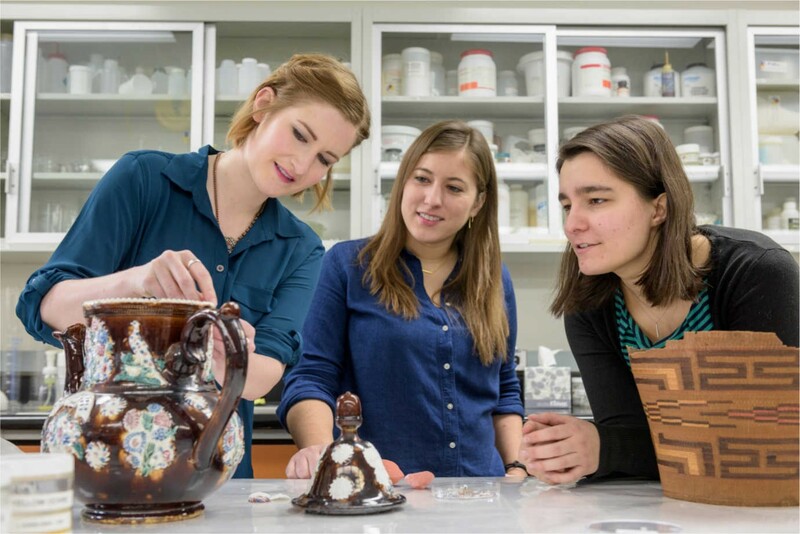 Leah Bright, Samantha Owens, and Madeline Corona (from left to right), NEH Fellows in the Winterthur/University of Delaware Program in Art Conservation, examine a few of their conservation projects including a 19th-century English earthenware teapot as part of their second year of study in object conservation. Image courtesy of Evan Krape, University of Delaware. Faculty and students from the department have had a significant impact on the United States and on the world more broadly. Program graduates have been instrumental in preserving many of our national treasures, including the Declaration of Independence, the Emancipation Proclamation, the Star-Spangled Banner, and even Dorothy’s Ruby Slippers from The Wizard of Oz. Their work touches personal lives as well: a team of faculty and students preserved 300 damaged photographs that were recovered from a Christmas Day fire near Columbus, Ohio, in which four family members lost their lives. Following the Wimberley, Texas floods, another team salvaged and stabilized 280 water-damaged photographs. And the program’s work in the Middle East, Asia, Latin America, Europe, and Africa has done much to foster cultural understanding through the preservation of valued cultural heritage items.